7 − 6 = Required Please enter the correct value. Each and every week, we focus on the biggest moneymaking opportunities being created in Silicon Valley and throughout the tech economy. Today – in the concluding half my two-part Q&A session with Money Map Press Executive Editor Bill Patalon – we're going to take a whirlwind tour of the Valley. That's because Bill put me through a "lightning round." He offered up one Silicon Valley opportunity after another… and then I responded with my current view of that sector. I even offered up a few stock recommendations – including my favorite metals play right now. I hope this lightning round gives you some solid insights into the most promising slices of the Silicon Valley economy. William Patalon III: Okay, Michael, I'll toss out the technology opportunity – and you give me two or three sentences telling folks how big the market is, how fast it's growing and how big a chance it has of becoming a "Next Big Thing" business opportunity. And if you have a recommendation that goes with it, mention that, too. Michael A. Robinson: (laughs) Revved up and ready to "burn rubber," Bill. MAR: Love this… just love it. Like you, Bill – and, I suspect, like lots of our readers – I grew up with "The Six Million Dollar Man" TV show back in the 1970s. Today, the science fiction that show depicted has become science fact. New Bionics disciplines include onboard intelligence (virtual and augmented reality), mind-controlled prosthetics, human longevity, commercial space travel, and synthetic biology. Add it all up and you're looking at an aggregated market worth $807 billion. Due to its $25 million investment in onboard-intelligence player Vuzix Corp. (Nasdaq: VUZI) last year, Intel Corp. (Nasdaq: INTC) is an intriguing player in this space. MAR: This long-talked-about slice of tech is finally becoming reality. In fact, it's destined to become part of our everyday lives – covering everything. We'll see online "chatbots"… voicebots as digital assistants… healthcare breakthroughs … national security through facial recognition… robots… even defense using AI-driven drones. 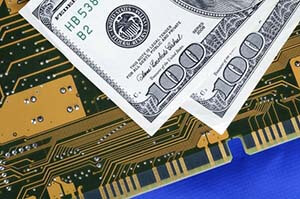 A Bank of America Merrill Lynch forecast says this market will soar from $58 billion in 2014 to $153 billion in 2019. The best big-cap tech play in AI is Watson. Unfortunately, Watson is "locked" inside IBM Corp. (NYSE: IBM). For a while now, I've been asking IBM to spin off Watson – and all of its cognitive computing acquisitions – into a standalone publicly traded company. I even sent IBM CEO Virginia Rometty a personal letter laying out my plan. Of course, there's a dark side to AI as well. Here I'm talking about the millions of jobs that could be lost in the coming years to robotics, AI, and other forms of automation. The consultants at McKinsey contend that existing automation technology – if we eliminated current financial, legal, and social barriers – could automate 45% of our paid work today. This sounds to me like a "jobless future." Bill, do you mind if I take a break for a moment from this Q&A to talk about this? WPIII: Sure, Michael, go ahead. MAR: McKinsey is far from alone in its pessimistic outlook. In fact, a new White House report that I've read says there's a 1-in-3 chance that middle-class workers will find their job replaced by automation in the next few years. And for working-class people, it's even worse. Those folks face 4-in-5 odds of losing their job to automaton. This is why I'm now working on an in-depth special report on AI, automation, robotics… and the job losses they could cause in the near future. In that report, I'll show you some ways you can prepare for this "jobless future." Okay, Bill, back to the lightning round. WPIII: (laughing) Thanks, Michael. Okay… Internet of Everything (the IoE). MAR: This all-encompassing technology spans the globe and connects everything from smart homes and smart cities to connected cars. It'll be key to transportation logistics and will be crucial to wearable tech. You'll have at least 50 billion connected devices and 1 trillion sensors in the field. Total profit potential is about $14 trillion, according to John Chambers, the former CEO of Cisco Systems Inc. (Nasdaq: CSCO). Most investors now know Amazon.com Inc. (Nasdaq: AMZN) is the leading cloud-computing company. But what they don't realize is that Amazon Web Services, Jeff Bezos' cloud unit, is rapidly getting into the IoE market as well. Everyone should be checking this out. MAR: IHS Automotive forecasts annual sales of vehicles with self-driving features and true self-driving vehicles hitting 21 million units within 20 years, including more than half the trucks and light-duty commercial vehicles sold in the United States and China. IBIS World says the global car market is worth $9 trillion. So, we're talking about a big impact. One of our plays here on autonomous cars is Mobileye NV (NYSE: MBLY). This Israeli firm is a leader in "computer vision" technology that helps cars detect and then avoid other vehicles, pedestrians, and roadway markings. Now, this is a pretty volatile stock, and it could take a while to see the gains I expect. But it's worth buying and holding onto. MAR: It's going through a major rebound, as we speak. The biggest impact won't be on consumers making things like toys and jewelry, but on industries like autos and aircraft production. Take Ford Motor Co. (NYSE: F), for example. Ford believes it can cut the cost of designing an intake manifold from $300,000 to $3,000. The Wohlers Report forecasts a sevenfold climb in the eight years ending in 2020, rising from $3 billion in the base year of 2013 to $21 billion. For a backdoor long-term play on this sector, I like Autodesk Inc. (Nasdaq: ADSK), which develops and markets 3D printing computer-aided design (CAD) software. WPIII: Miracle Materials – including graphene. MAR: Graphene I love for the long haul. In the near term, however, it remains risky. Right now, my favorite material in this space is silver. Simply stated, you can't have modern electronics like smartphones, tablets, water purification, or even spacecraft without silver. The sector was greatly oversold and is now in a big rebound. My favorite firm in the space is First Majestic Silver Corp. (NYSE: AG). I know the CEO personally and think he is by far one of the best leaders in the entire metals industry. MAR: Another day, another hack. Retailers, banks, health insurers, even the Pentagon gets hit. I've personally had my own accounts hit four times – that I know about (laughs). And I'm a security freak. So, when MarketsandMarkets says the industry will be worth $170 billion by 2020, I believe them. My pick here is Raytheon Co. (NYSE: RTN). It's our "stealth" cybersecurity play. We're sitting on gains of 18.3% on that one just eight months after I recommended it. MAR: We're talking trillions of dollars here, as well, because ComScore says 17% of all digital commerce comes from mobiles, and that equates to 2.5% of all transactions in the world. With more than 2 billion smartphones in use globally, people now spend more time on their handhelds than they do watching television. I've called NXP Semiconductors NV (Nasdaq: NXPI) the "secret winner" of the digital payments war between Apple Inc. (Nasdaq: AAPL) and Alphabet Inc. (Nasdaq: GOOGL). It makes many of the chips that make payments tech possible. WPIII: And NXP has been a huge winner for my Private Briefing subscribers, gaining as much as 387% after I recommended the stock at $23.40 a share back in May 2012. Back to the lightning round. Wearable tech. MAR: Another major growth area, for sure. IDC forecasts "basic" wearable-device shipments to rise from 52.1 million units in 2015 to 73.7 million in 2018. And Apple looks to have sold 12 million units of its smartwatch in its first year on the market, which I calculate as being worth about $5.4 billion. And we're still in the very early innings here. WPIII: It seems like we're in the early stages of a lot of this. MAR: I think so, Bill… and that's good. Because it means that the biggest slice of the growth – and the biggest piece of the "upside" – is there for you to reap. WPIII: And that's where we want your subscribers to be… right on the start of that "ramp." MAR: And thank you, Bill. And I'll see all of you soon.